When you think of a bridge, your mind recalls the image of a road or walkway spanning a body of water or arching over the space above another road. It’s a similar scenario with your teeth—a dental bridge covers the gap between two teeth with a third false tooth placed to fill in the empty space. If you’ve lost a tooth, whether, through decay, trauma, or gum disease, a dental bridge can help restore the appearance of a full smile as well as offer complete functionality of the teeth in that area. The false tooth that fills the gap is known as a “pontic,” and the teeth on either side of it (called “abutment teeth”) are secured to the pontic through a series of connected crowns. 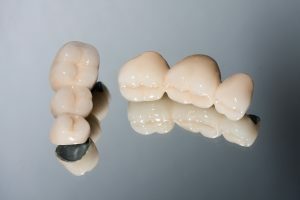 Considering a dental bridge to address a gap in your smile? A bridge is an excellent cosmetic dentistry solution, and also provides several benefits. Durability – Properly cared for, a dental bridge can last many years, even decades. Appearance – Dental bridges provide an all-natural look for your smile, restoring confidence and appeal. Function – If you’ve suffered from poor chewing ability because of tooth gaps, a bridge can fix this. It can also improve speech for those struggling to speak due to missing teeth. Contact us today to set up an appointment with our cosmetic dentists and determine if a bridge is the best solution for your dental needs at our Eagan dental clinic.